Few days back, we reported that bookings of Yamaha YZF-R3 are open and now the long awaited Yamaha YZF-R3 has been launched in India today. Popular celebrity and Yamaha’s brand ambassador John Abraham was present during the launch event. 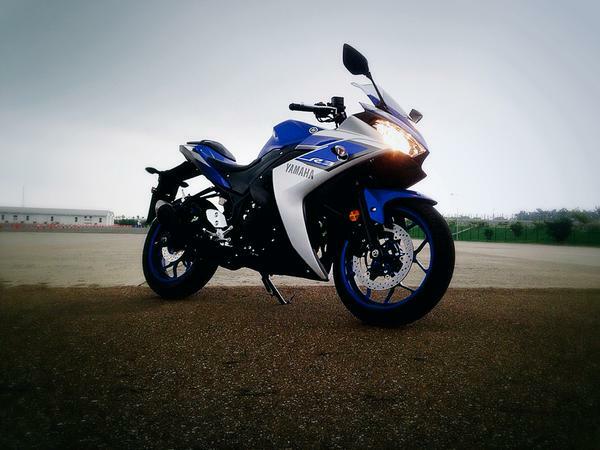 Yamaha YZF-R3 is available in 2 colour schemes – Blue & White as well as Red & Black, the Yamaha R3 is priced at INR. 3.25 lakh (ex-showroom, Delhi). During the event, Yamaha said that the bike’s deliveries shall start from 11th of August 2015 through 100 authorised dealerships. The vehicle shall rival KTM RC 390, Kawasaki Ninja 300 which is present during the segment. The Yamaha YZF-R3 is brought to India as a completely knocked-down (CKD) unit and has been assembled locally. Yamaha YZF-R3 is the more powerful version of Yamaha R25, Yamaha R3 first made its debut at EICMA in 2015. This bike from YZF-R3 derives its power from twin-cylinder engine whose capacity is 320cc and is the bored out version of the Yamaha R25’s engine. The engine of Yamaha YZF-R3 is mated to a 6-speed transmission, and it manages to churn out a maximum power output of 41bhp at 10,750rpm and a peak torque of 29.5Nm at 9,000rpm. When you compare this with KTM RC390, – the engine of KTM RC390 churns out more power (43bhp) despite just having a single-cylinder. The all new Yamaha YZF-R3 takes 2.89 seconds to attain a speed of 60kmph mark from stand still, and takes 6 seconds in order to reach 100kmph. Yamaha YZF-R3 provides a top-speed of 187 kmph. Talking about the design of the bike, Yamaha YZF-R3 resembles Yamaha R25; This bike looks more sportier than Yamaha R25. Some of the design elements from YZF-R are borrowed: for example the dual head-lamps, digital-analogue console, silencer and alloy wheels with 10 spokes. Talking about the dimensions of the bike, Yamaha YZF-R3 measures 1135mm in height, 2090mm in length, 1280mm in wheelbase and has a weight of 169kgs. The motorcycle’s 160mm of ground clearance certainly goes well with Indian road conditions. The all new Yamaha YZF-R3 is priced at INR. 3.25 lakhs (ex-showroom, Delhi).